Whether your projects are small or large, eventually your going to need to get organized. And the Omni Group has a nifty tool that they are sure will do the trick. It’s called OmniFocus and it is available for the Mac and the iPhone. Sorry, PC and Linux folks, that’s just how the Omni Group rolls. An OmniFocus individual license runs $79.95, and a family license for up to five persons runs $119.95, although educational and group pricing is available as well. 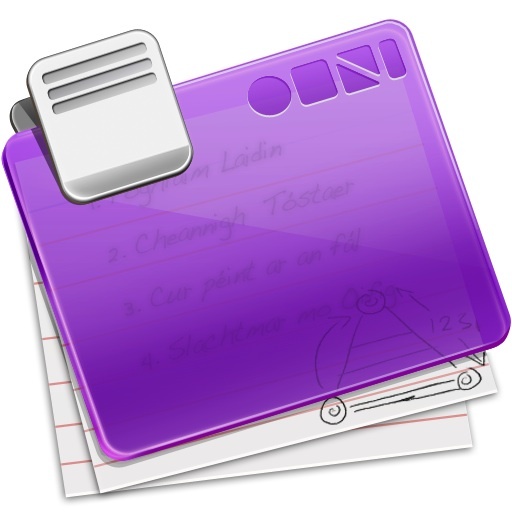 The Mac version is available from http://www.omnigroup.com/products/omnifocus/, and the iPhone version, which runs $19.95, is available through the iTunes store. You can download and use the Mac version without a license for a 14 day trial. An upgrade for the iPad is planned for summer of 2010, but isn’t currently available. 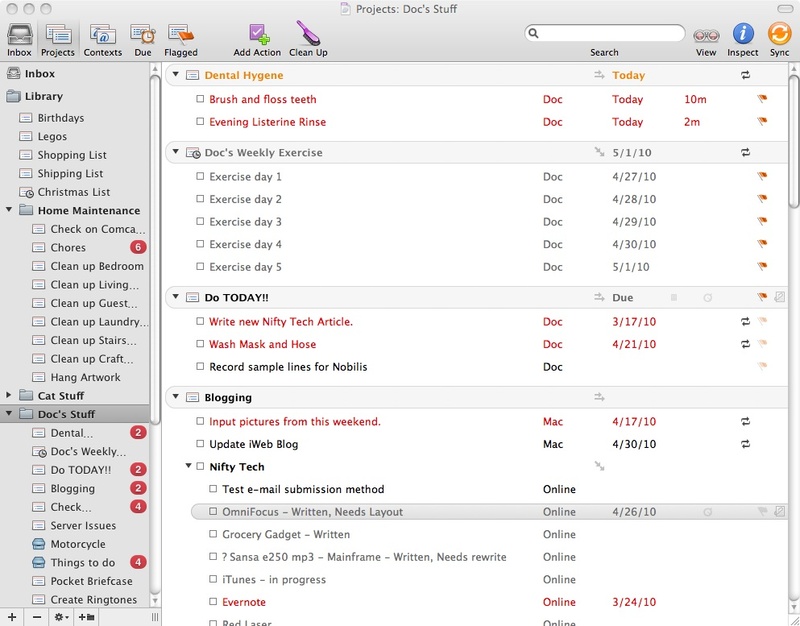 OmniFocus is built around the Get Things Done model of project management, but is flexible enough to accommodate many different styles of structuring projects. But the basics are simple. Start by capturing all the individual tasks that need to be done, in as much, or as little detail as you like. You can just put down a simple description, or you can add start and end dates, duration, and additional notes. The important thing is to capture the pieces. Next, start grouping these individual steps into projects and putting them in order. OmniFocus lets you group things in folders for convenient access, and allows you to break steps in your projects down into sub-steps just by nesting them with a simple drag and drop. Your projects can be set up to execute the steps in order, or allow them to be done in any order. Or you can just create a container to drop individual independent tasks into. The last bit of setting up is to assign a context to the projects and steps. Contexts can be people, places, software, or if you use sub-contexts, combinations of the above. A Write E-mail task could have a context of Work, or Computer, or Work:Computer. Or even Work: Doug: Computer: Online. Again, you can make it as detailed as you need it to be. So after you get your projects set up, the fun begins. OmniFocus lets you sync your projects to other computers using OmniFocus, via Bonjour, a disk, or Mobile Me (or another WebDAV server in the cloud). So if you’ve got multiple computers, you can access your projects on all of them. Or you can sync it to your iPhone, so you can carry your projects with you. OmniFocus also integrates with Mac OS X, letting you sync tasks to iCal, add and update tasks via Mail, and even search for them using Spotlight. Once you’ve set up syncing, OmniFocus syncs automatically when you open the program, just before quitting, and one minute after any change has been made. OmniFocus lets you look at your tasks by project, either an overall look at all projects, or every project in a given folder, or you can focus in on a single project. Projects can be set to automatically complete when the last step is completed, or you can leave them as ongoing projects and add other steps later. OmniFocus highlights tasks in orange that are due soon, the default for “soon” being in the next 24 hours, but you can edit that setting to suit your needs. OmniFocus also highlights overdue items in red so you can see how behind you are and focus on what you need to do to catch up. Items that have a future start date, or cannot be done until another task is complete are greyed out. You can even create repeating tasks and projects, or pre-create projects that won’t be started until sometime in the future. Or you can put an entire project on hold. In addition, you can view your tasks by context. So when you’re at work, you can look at just the work tasks, at home, just the home tasks, etc. A really nifty variation of this is available with the iPhone version of OmniFocus. In Contexts on the iPhone, you can set a location for a given context, and then sort your tasks by your geographic distance from the locations. This is very useful for running errands, but it can be a little tough setting all the locations to begin with. The iPhone version of OmniFocus can act on its own, or you can sync it to the desktop version, or just sync several iPhones together through the cloud. The iPhone version is fully functional, and lets you mark items as complete, set any of the fields, or even create new tasks on the fly. And the iPhone version syncs on startup, and automatically after a minute when you make changes, although if you exit the program within that minute, you can prevent the sync. You can also set it to only sync manually, which is useful if you’re in an area with poor connectivity. There are a few nagging issues with OmniFocus. When the application was first launched there was a tendency for cumulative transactions to cause the database to swell. This led to very long sync times, and could make the mobile version effectively unusable. The Omni Group has since fixed this issue by better management of a self-compression script in the database. But some of us old timers still feel better using a manual compression script once a month. A current problem is a tendency for OmniFocus to fail to close out recurring groups of tasks when the last task is completed. This can lead to duplicate sets of tasks. It is easy to remove the duplicates, but it can be somewhat irritating to have to deal with them. For my family, OmniFocus has been will worth it. My wife and I can work off the same plan, and even if we’re each running errands in different parts of town, we know almost immediately when the other has completed a step. It has been very handy for organizing our household chores, shopping lists, Christmas lists, and our private projects. In the end, the syncing and the ubiquity of OmniFocus really pushes it up to the level of Nifty Tech. Wondeing if you use a family license or juts work off the same license. I am using the system myself but want to integrate my wife much like you are describing. We have an Imac, each a i phone, and 1 Ipad. We tried using just a single license, but found that we had too many issues with being able to only access the database from one machine at a time. In the end, we upgraded to the family license and things have gone much smoother for us since then. Previous post: #FollowFriday – @pfischer: podcaster, father, geek, Balticon supporter. Next post: #FollowFriday – @appadvice: iPhone, iPad and iPod Touch News and reviews.